Saved from the Inquisition, and forced into slavery to write the eyewitness account of pirate battles in the Caribbean, can the forgotten French surgeon, Alexandre Exquemelin, survive? Will his account, cynically manipulated and distorted, discredit his friend, Henry Morgan? Or will another soul be damned? But what was a young student of medicine from France doing in brutal, lawless Tortuga? What made him give up six years of study to become an indentured slave? Was it religious persecution? Or forbidden love? How did he come to join Henry Morgan, a Welsh soldier in the service of England? Why did he write his book about the exploits of these pirates? And why did the English version of his book cause Henry Morgan to sue the publishers for defamation of character? The unwilling spy, his forbidden love, the inquisitor, or the pirate - who will pay the price for damning Henry Morgan? The audio version of this play can be downloaded by clicking here. 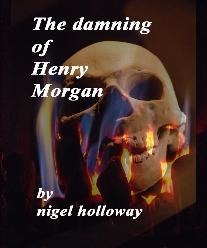 The full-length novel of this story (also called 'The damning of Henry Morgan' surprisingly) is now available from Amazon as a Kindle ebook. You don't need to own a Kindle to read it - there are free Kindle readers available for just about any form of digital device from iPhones to PCs, from iPads to Macs. You can find the novel at Amazon.co.uk.